Attendance is free and open to the public. Seating is limited so we encourage prior registration. 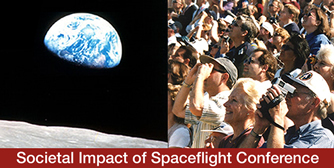 To register, please e-mail histinfo@hq.nasa.gov and type "societal impact conference registration" in the subject line. The Hirshhorn Museum is at the corner of 7 th Street SW and Independence Avenue. It is easily accessible from the L'Enfant Plaza, Smithsonian, or Archives Metro stops. For more Metro information, see http://www.wmata.com. There is limited parking nearby. For more information, please see http://hirshhorn.si.edu/visit/directions.html. General information about the Hirshhorn, including museum exhibits and hours, is at http://hirshhorn.si.edu/. The Hirshhorn is several blocks from NASA Headquarters. See http://www.nasa.gov/centers/hq/about/map.html for more details. Please note that food and drinks are not allowed in the Hirshhorn Museum. We will provide suggestions for nearby restaurants at the conference. The Hirshhorn Museum is accessible for wheelchair users. For more details, see http://hirshhorn.si.edu/visit/accessibility.html. There are a number of hotels nearby. We are not reserving a block of rooms at one particular hotel so travelers are free to stay wherever they prefer. NASA travelers should contact their local CI Travel office. For specific hotel suggestions, please contact us. For further information: Please e-mail histinfo@hq.nasa.gov or call the NASA History Division at 202-358-0384.